This smaller munchkin came with her mom and took home our two companions. Now it became time to start our journey and make this camper van our “home”. Thanks for sharing, though, Jen! 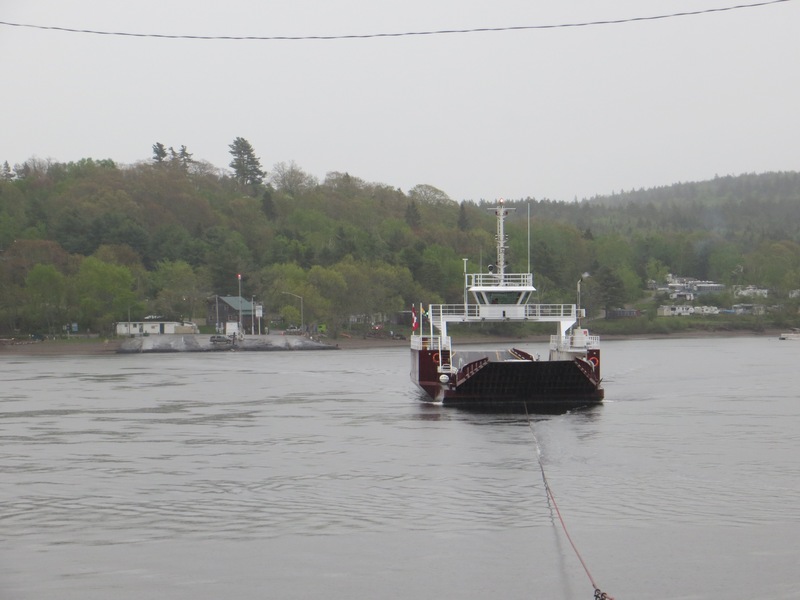 On the Ferry from Digby to St. John. 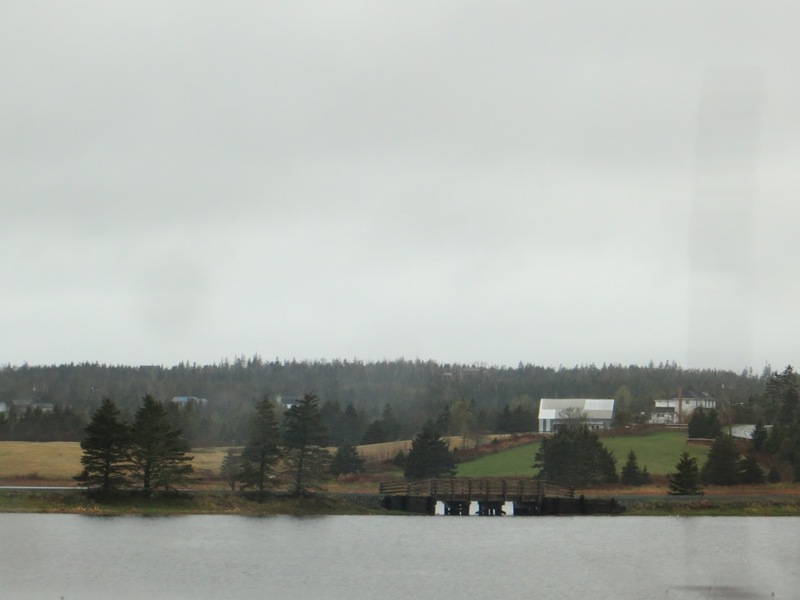 New Brunswick..along with the rain. So glad that didn’t happen yesterday. Then another ferry to our night’s camp site at Harding’s Point. The camp ground is right there, on the shoreline. So “campy” looking. An interesting first day. What a simple pleasure to have my ritual morning coffee in bed, shared with two cuddly munchkins playing games with me. I could very used to this. A special slice of the day. We had a busy day with dirt biking, water sliding, paddle boating, play grounding, hiking..and lots of eating. When little bodies put out this much energy, they have to keep topping up. Great weather for eating outside..so lucky with that. Val’s wine was appreciated too. Man, did we need a glass by supper time! 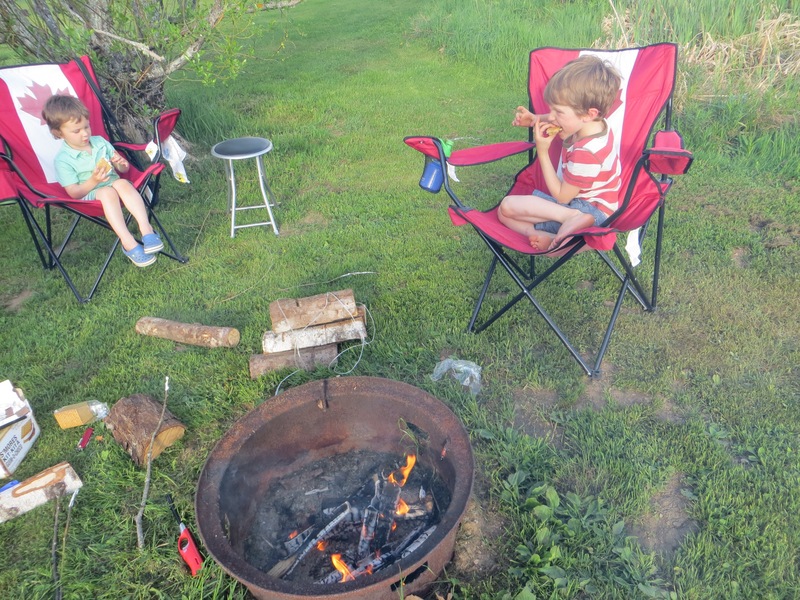 All camping days have to end with marshmallows roasted over a fire. Frank and I were roasted too from keeping up with the boys all day. All camping ends with falling into bed exhausted. 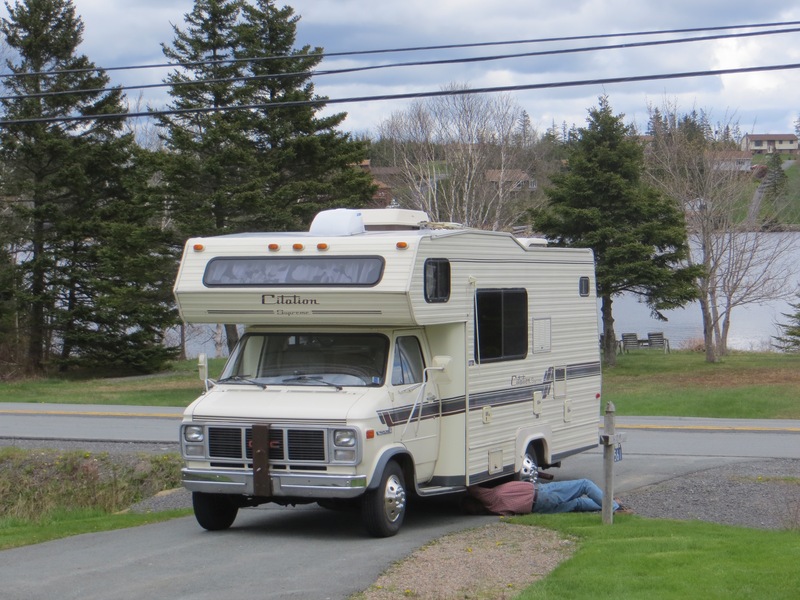 These two needed to try out everything in the camper van, as they, and Frank and I, were going to spend a first night in it, at a campsite near Wolfville. 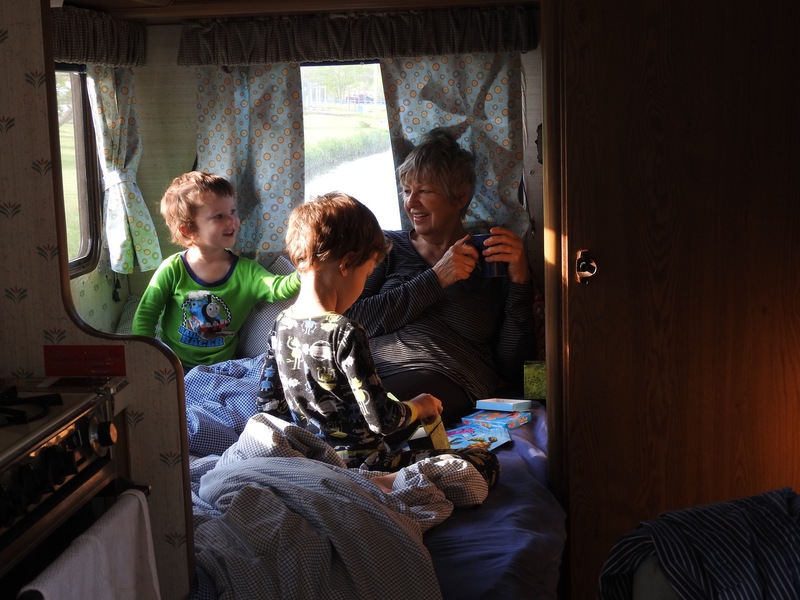 The trip begins, with two days of the best kind of grandparenting available…having so much fun. It’s late at night, still packing for our departure tomorrow morning…but far from ready as we just got the camper van back from the mechanic’s today about 4:30 p.m.! hope it runs well now, because we’ve run out of time. 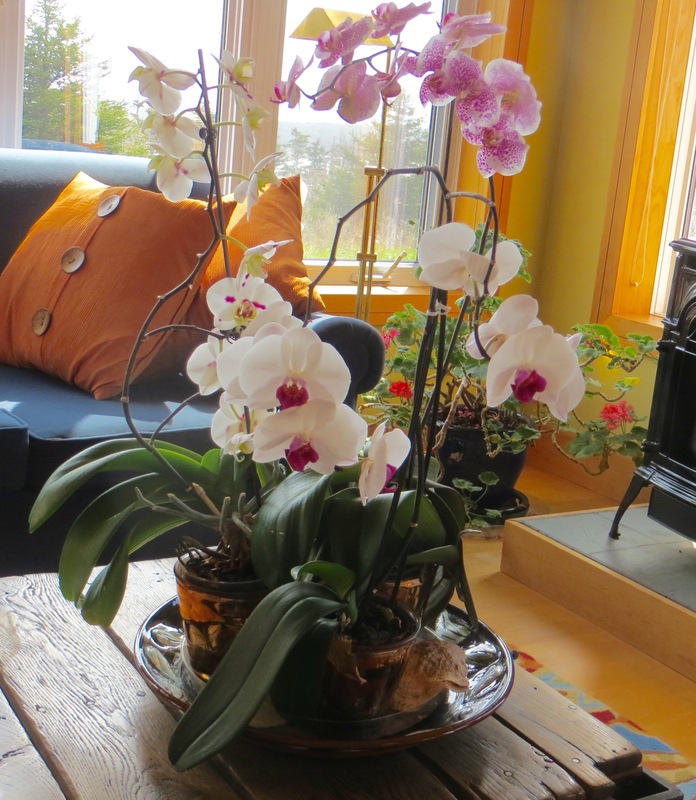 We’re leaving in a few days, and the house will be “house sat”, so the orchids will be enjoyed, but I wonder how they will look upon my return. They are wonderful plants, blooming for months upon months, then one day…the blooms start to fall, and only the leaves are left. At this moment, all four look amazing, much like how everything will look when we’re gone…summer will set in, the flowers outside will bloom, the bushes will flower. 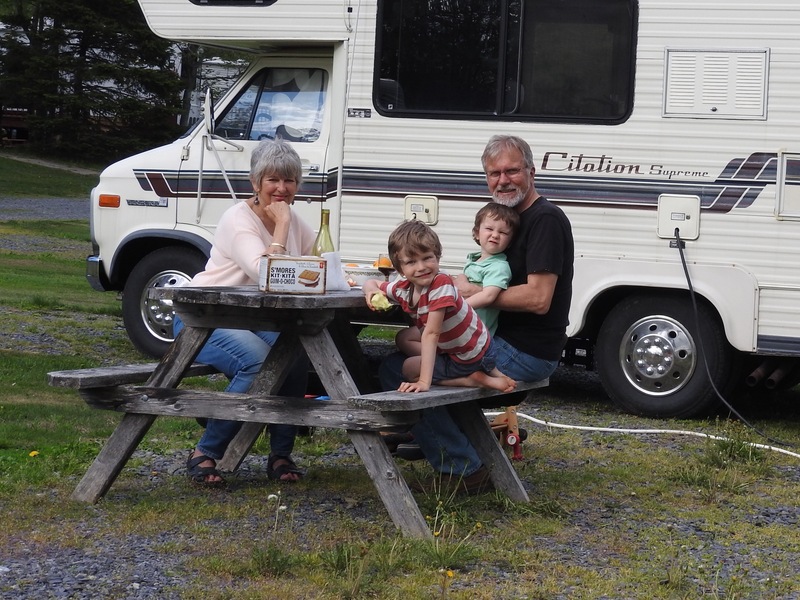 I’m just not used to taking a “summer holiday” and missing this time of year….On the other hand…pretty psyched to be getting into the R.V. on Friday!! and once we’re down the road, or around the corner, even, I won’t be thinking about my plants at all. Do whatever you want, orchids. 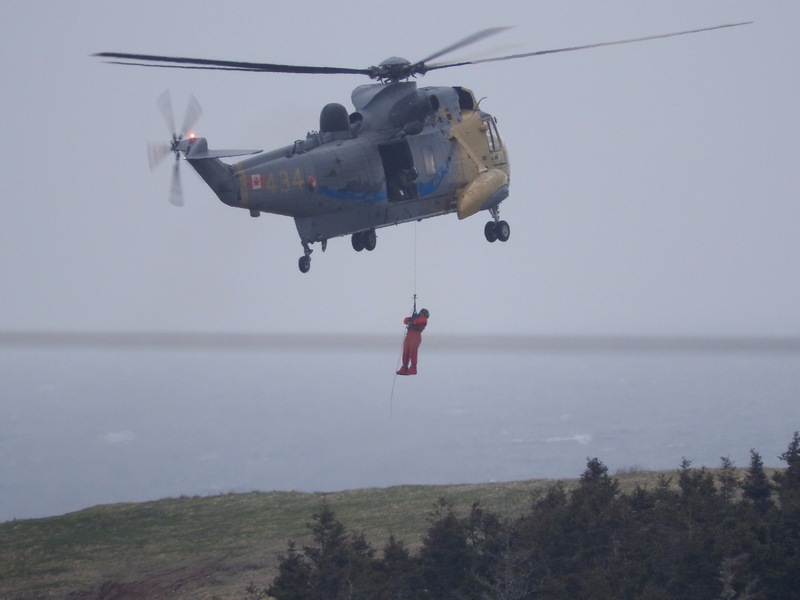 For today’s “sighting”…it’s not an animal…it’s a rescue practice happening on the head land opposite our house. The noise made it feel as though the helicopter itself was landing on our lawn. Frank captured this shot from the tower. (he loves that vantage point, and that zoom). Military practices are quite common on this headland, and helicopters flying overhead are frequent…so I suppose that this could fall into the “wild life” category along side the “wildlife” category for our neighbourhood. 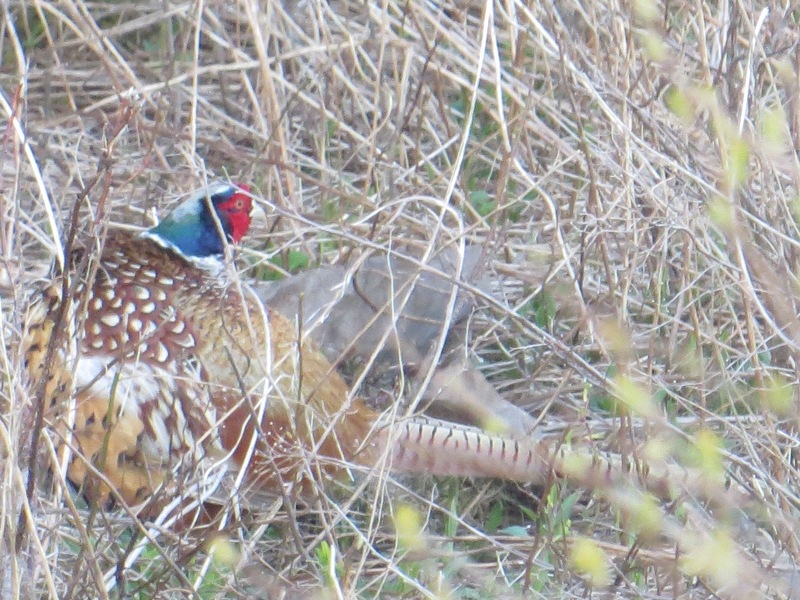 While working on the flowerbeds, I managed to see the pheasant through the dry grasses in some of our wild areas. He was grooming himself! My ever present camera was able to zoom in on those lovely feathers and colours. 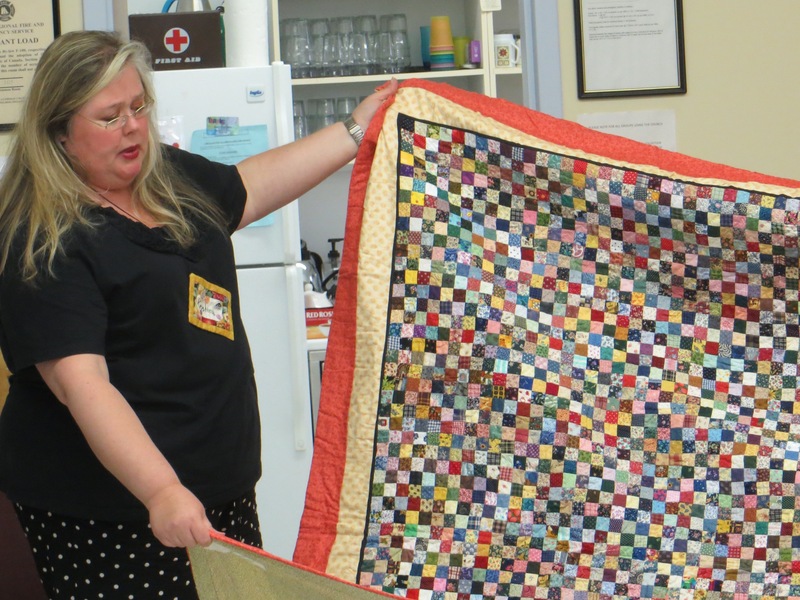 At quilt gild tonight, Khristina showed, amongst many beautiful quilts, this one that has over 6000 pieces in it, all hand sewn! It made me think of the pheasant’s feathers and head colour…the magic of nature, put into art form. 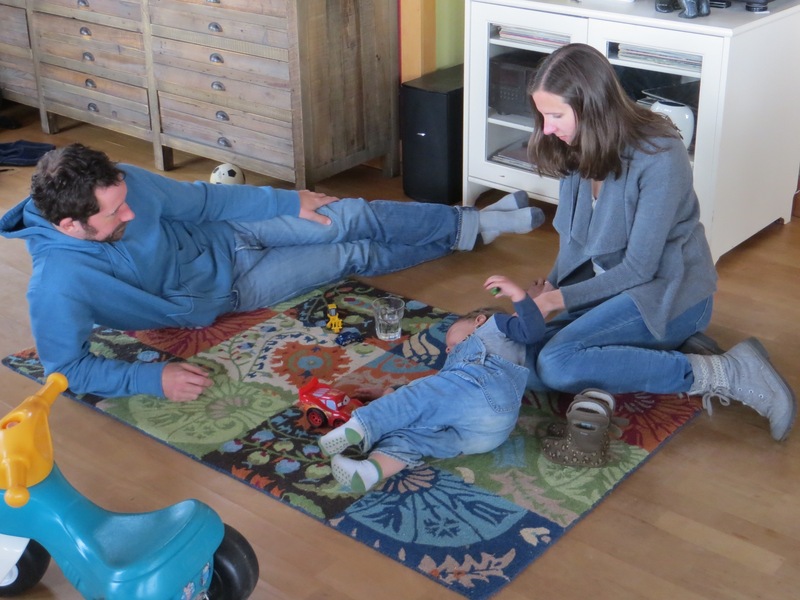 Noah and family being mellow…and looking very much like they belong together…a little unit of love and denim encircled within a little rug. 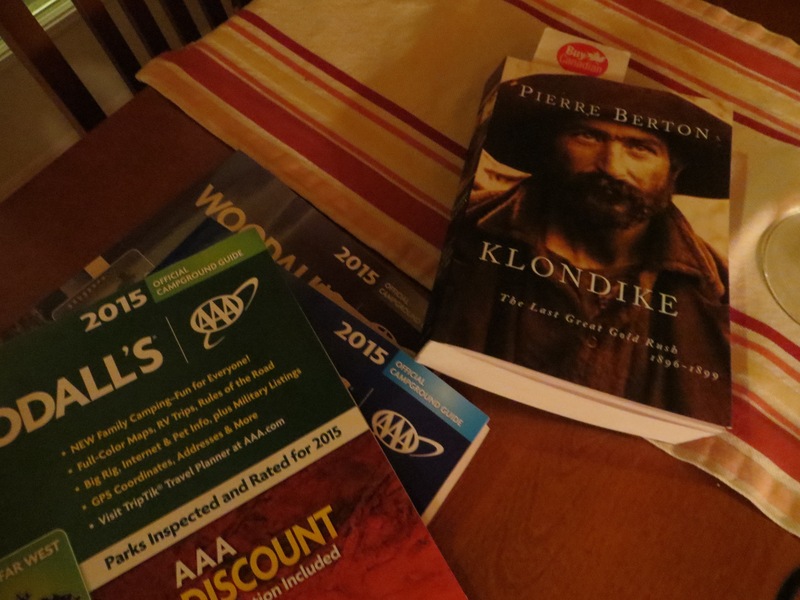 Noah is helping his Opa decide on rain gear for the big camping adventure. 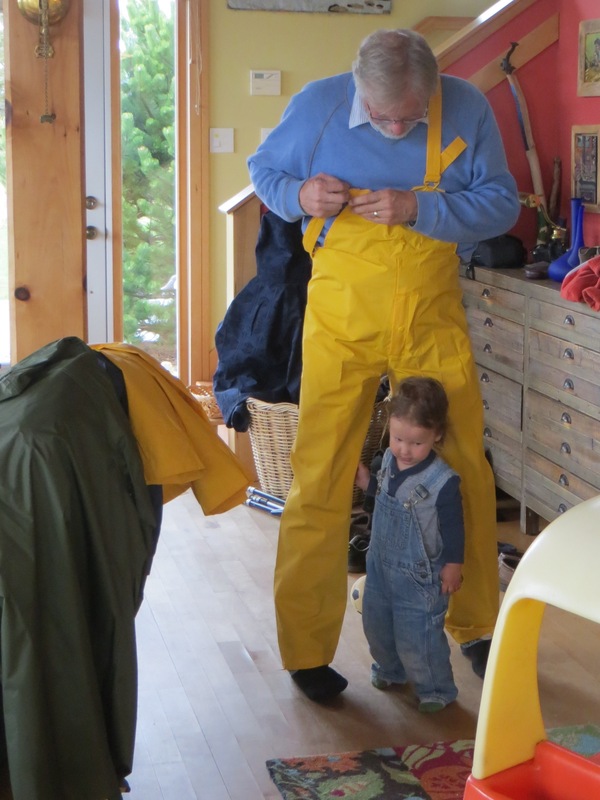 He either thinks he’d like to pull these strange yellow pants off Opa, or is pleased that they look sort of like his own overalls. Ummm? 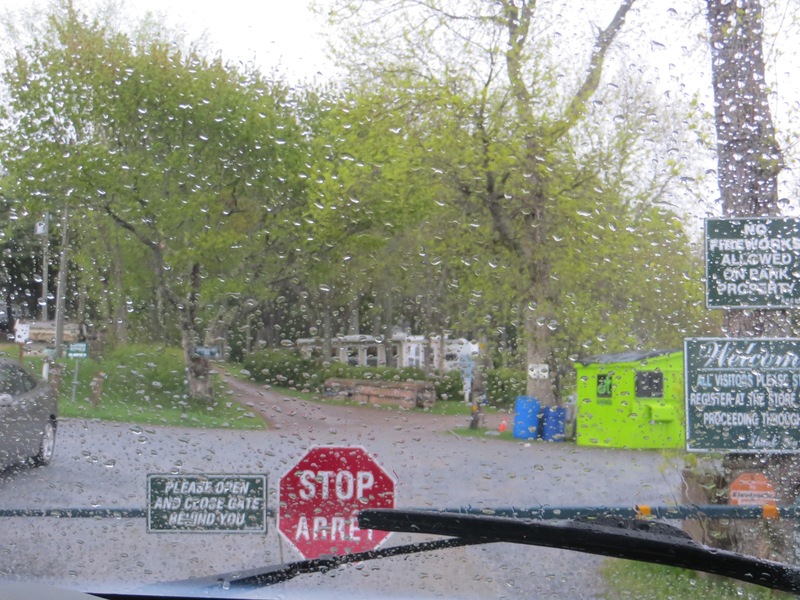 We went to visit Marilyn and Lou, who had camping advice for us, as well as great homemade cinnamon buns, but upon leaving, the camper’s parking brake was seized. Frank called a mechanic, who gave him some tips to try.. Step one was rocking the van back and forth, gently using the gas pedal. Step two was to tug hard on the emergency brake cables. Step three, seen here, was banging on the back wheels to loosen the cable. 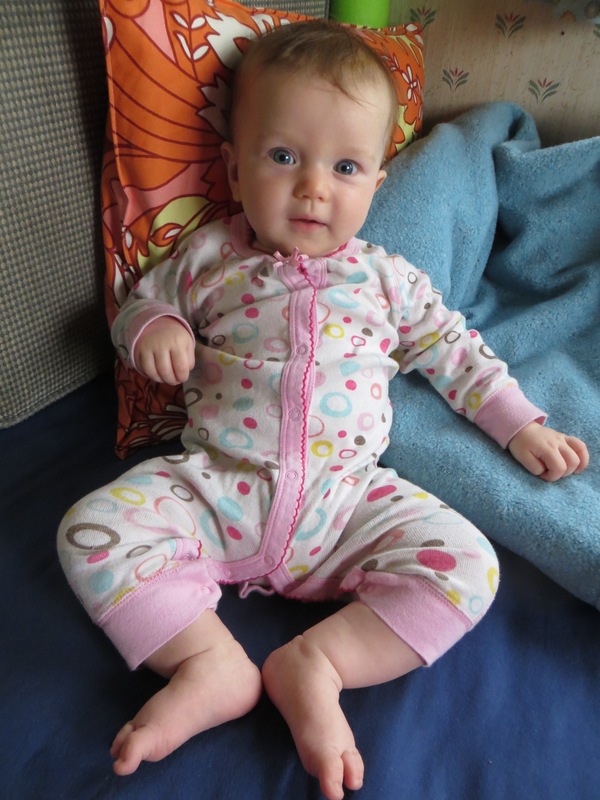 After repeating these steps a number of times, step two worked…sort of. We were able at any rate to “limp” home. 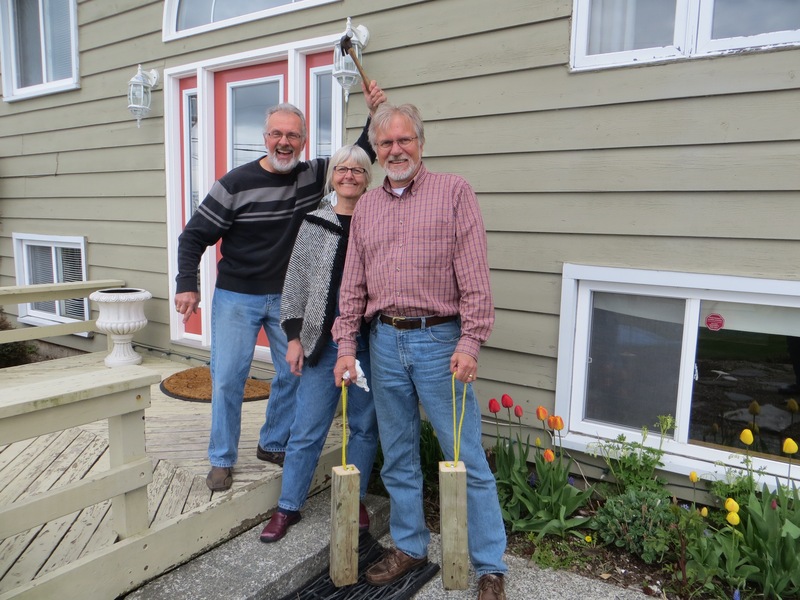 Lou, with the hammer, Marilyn and Frank, who is holding tire blocks that Lou whipped up while Frank worked on the van. These blocks kept the van from going backwards onto the road, and they also came home with us, to travel to Alaska. 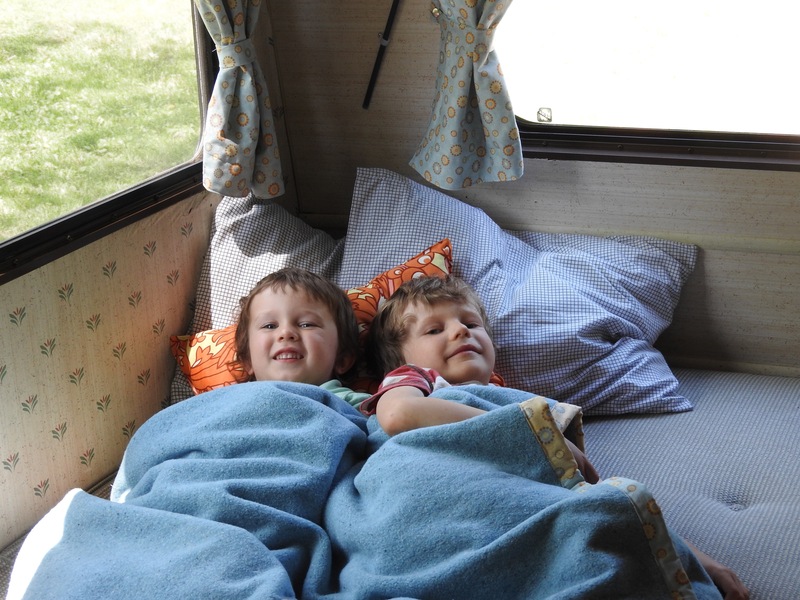 So we had a lovely visit, learned a lot, received lots of things for the van, and had our first camper van adventure! Thank you Marilyn and Lou for all the help. 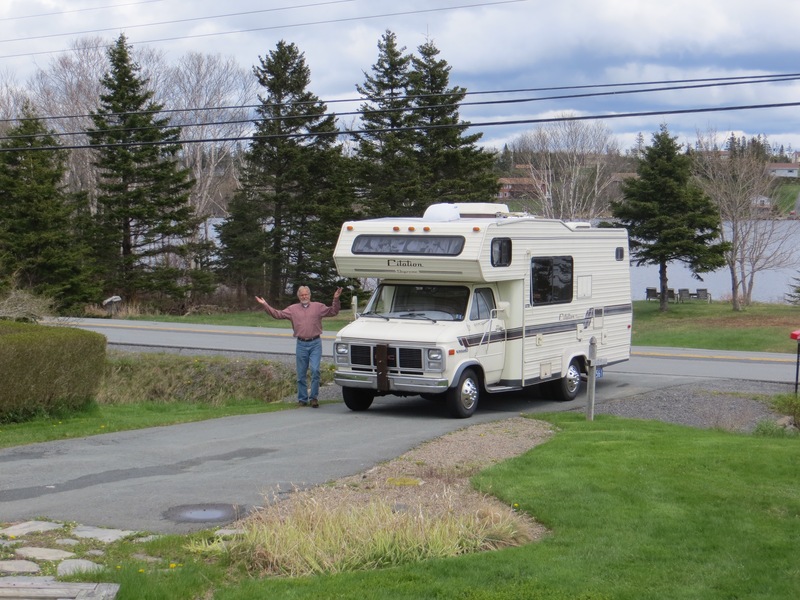 Outfitting the camper van — floor matts, bug spray, new shower curtain (for decorative purposes …the original was passable but made a horrid crinkly sound), hiking boots and so on — takes a lot of driving about. 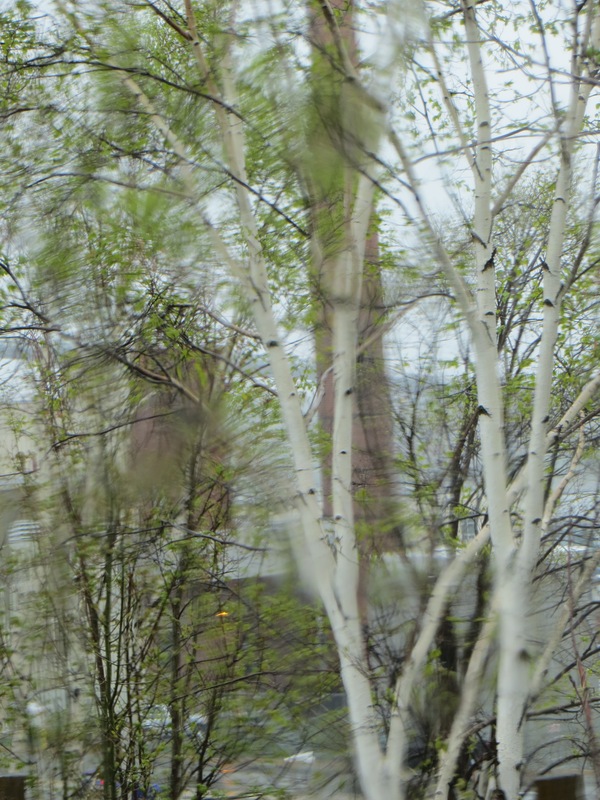 I took this shot of the birch trees, in the rain, from the car….as they always remind me of Ontario, perhaps only because they don’t grow in our particular area. Love the abstract nature of the photo. Travelling back near home, still raining, misty, calm after all the running about..
…closer still, looking like fall colours rather than the chartreuse of the city trees…but that makes it more interesting when we travel that short distance to the city and get such a different vibe, from colour to energy. 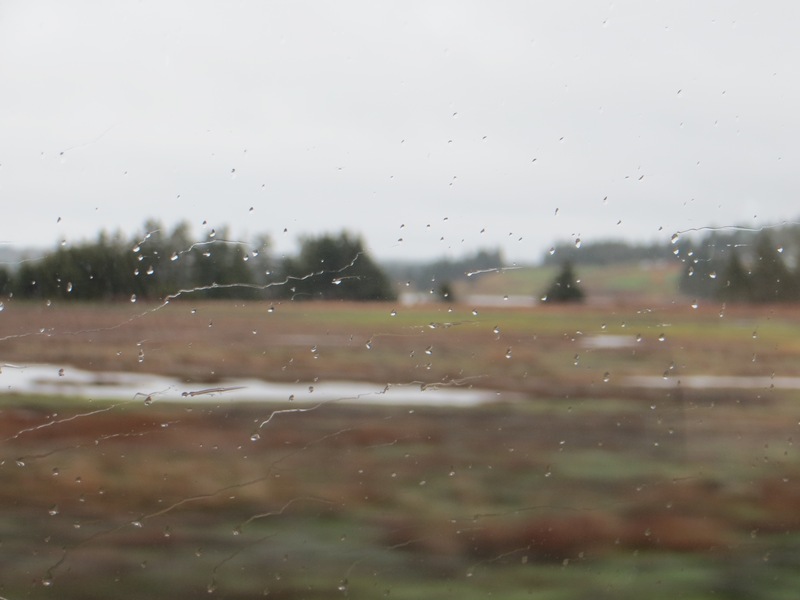 Actually, when you travel in any direction for about an hour, the scenery is different. This small province has a lot of variety, within easy reach. 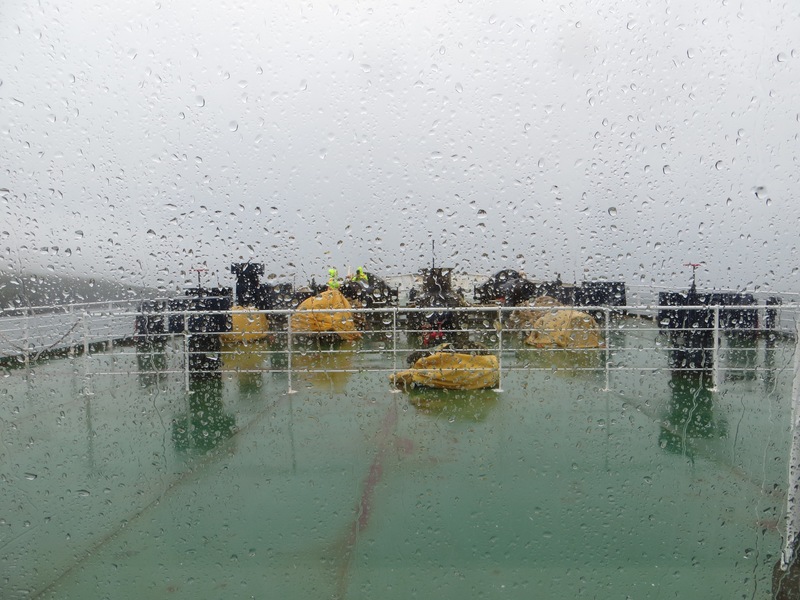 Now if its weather was better….but then nothing is perfect.